Royal Ace is a US-friendly online casino using software from the highly regarded Realtime Gaming company. 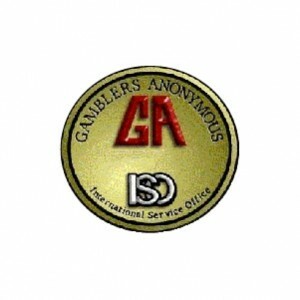 There are two wonderful offers that this casino is willing to provide to new players who sign up through our links. 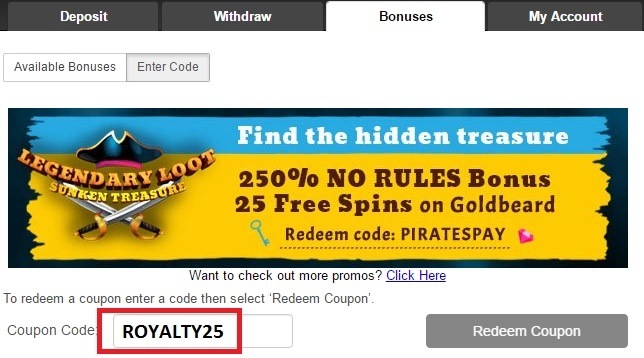 You can get a $25 free chip with no-deposit required using the code ROYALTY25 and then take advantage of a 400% up to $4,000 bonus with the coupon code CASINO400. Click here to visit Royal Ace Casino Now. You’ll need to input the relevant code in the cashier section of the casino client. 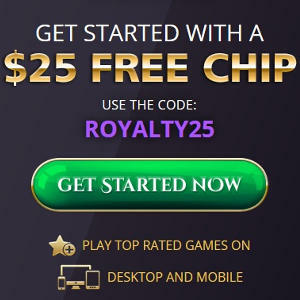 In the case of the ROYALTY25 no-deposit free chip, that’s all you’ll have to do to get your free bonus money. When you use CASINO400 to get a 400% up to $4,000 match, however, you’ll have to then make a valid deposit before your bonus will be credited. We recommend taking advantage of the free chip first to get in some risk-free gaming and then using the welcome bonus code when you’re ready to make a deposit. Click here to go to Royal Ace Casino. You can only use the ROYALTY25 $25 free chip on slots and keno. It comes with a 30x wagering requirement, so you must place total bets of $750 or more before cashing out your winnings. The only valid payout amount on this bonus is $100 – no more and no less. This restriction includes the value of the free chip itself, so you must amass winnings of $75 before you can request a withdrawal. The deposit bonus provided under the terms of the CASINO400 coupon can really increase your winning chances, but there are certain rules you must follow. First of all, it’s only applied to deposits of $30 or greater. When you redeem this code, whatever amount you fund your account with will be multiplied by 400% and the corresponding sum will be added as bonus funds up to a max of $4,000. This bonus is for playing purposes only; it will be removed from your account when you request a withdrawal. Before initiating any payout, you must fulfill wagering obligations equal to 30 times the sum of your deposit and bonus. So for example, if you deposit $100 and get a $400 bonus, then you’ll have to bet at least ($400 + $100) * 30 = $15,000 before the bonus is cleared. If you play on table games or video poker, then this is doubled to 60x. Baccarat, Craps, Roulette and Sic Bo are prohibited from being played with bonuses. 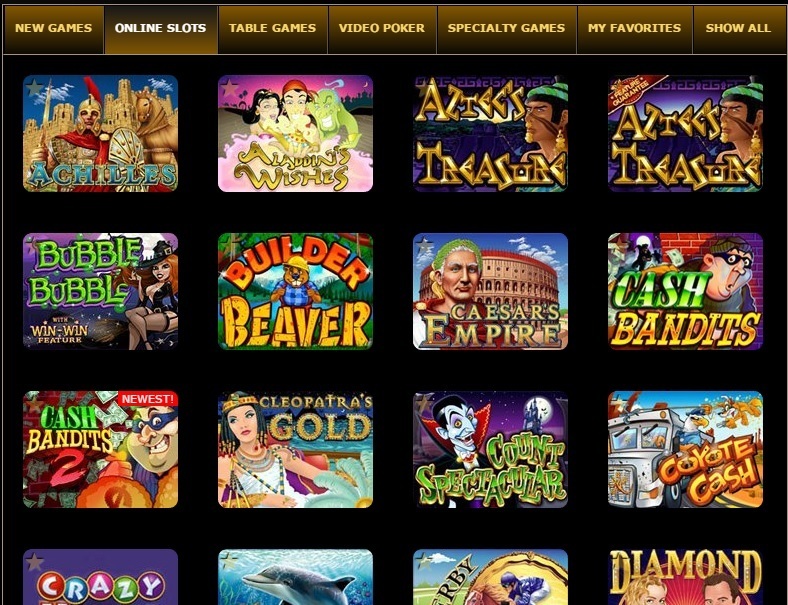 The Royal Ace Casino supports several payment processors for deposits: credit cards, Players Rewards Card, and Bitcoin. Those outside the United States and Canada can additionally fund their accounts via Neteller. If you desire some assistance with making your deposit, you can call a toll-free number or hop on Live Chat with customer service personnel. When it’s time to get ahold of your winnings, you can use Bitcoin, check, or Neteller. As you can see, the only method that’s available to Americans for both depositing and withdrawing money is Bitcoin. We strongly advise you to get set up with this digital currency if you haven’t done so already. Bitcoin makes the process of transferring your money to gambling sites easy and smooth. There are more than 250 games in the fully featured download casino, but this number is reduced by around 50% in the Instant casino, which uses responsive web design to remain compatible with smartphones, tablets and other devices that have web browsers. The Instant games do tend to load a bit faster, though, especially when compared to the first time you play a given game in the desktop casino. This is because the full PC casino version must download each separate game that you want to play, which sometimes takes a minute. If you’re looking for games to help you clear your bonuses, then we’ve found a few fun titles for you to try out. Remember, the ROYALTY25 no-deposit chip can only be used on slots or keno, but the CASINO400 deposit bonus can be used on almost every game. 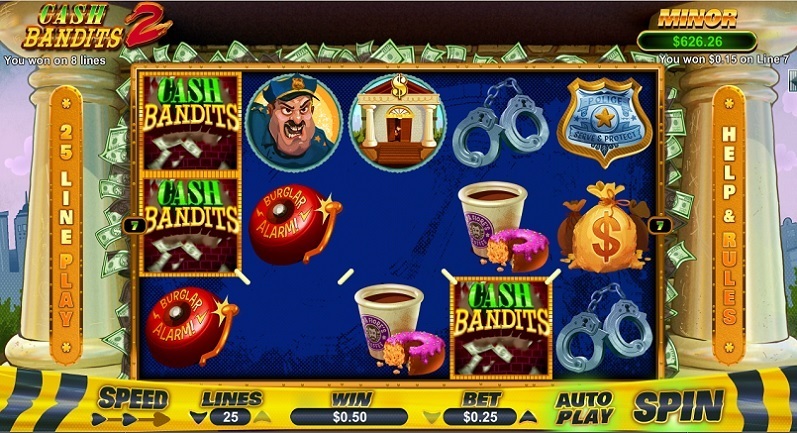 Can you pull off a big heist in this five-reel, 25-line video slot? When three scatter robber symbols show up, you’ll get five free spins and have the opportunity to unlock up to 100 additional free spins with the Vault feature if you can guess the right combination. A progressive jackpot can be awarded at the end of any spin. This table game is just like standard blackjack, but there’s an optional Perfect Pairs side bet that you can make. Get 6:1 if your two starting cards make a pair. This jumps to 12:1 if they’re the same color and 25:1 if they’re the same suit. Taking its cue from feudal Japan, the Ronin slot machine appears to be a straightforward 20-line game. But there’s more here than meets the eye because there are three separate free spin features and a random progressive jackpot. When you’re done with the ROYALTY25 free chip and the CASINO400 welcome bonus, there’s a lot more to still look forward to at Royal Ace. Management has deployed a full roster of other promotional specials for you to enjoy. There are five levels in the Royal Ace VIP program: Jack, Queen, King, Ace and Royal Ace. As you move through the tiers, you’ll get better rates of comp point accrual. Players at the top levels get cool stuff, like exclusive bonuses and special gifts. Receive a 400% up to $4,000 casino bonus! You can find more information on the latest Royal Ace promo codes here. Royal Ace Casino is managed by the same group that manages the popular Planet 7 Casino. If you’d like to find another great no deposit bonus, review these Planet 7 bonus codes for some amazing offers. I've never heard of Royal Ace Casino until I read this review and figured there's no harm trying out the casino with a $25 free chip - well I first have to say that the $25 bonus is legit and there's no deposit required but obviously there's always catches which is a 30 times rollover... this review actually goes thru these details so kudos to you guys cuz usually the fine details are glossed over. Regardless, I did end up with a few bucks and really enjoyed the casino. It deserves my 5 star review. Thanks.